Jody L. Lomeo is inheriting a Kaleida Health hospital system that lost $14 million during the first nine months of last year. It is locked in a battle for patients with the Catholic Health System, not to mention hospitals in Rochester and western Pennsylvania, at a time when inpatient visits have declined at hospitals across New York. And Thursday, the day Lomeo’s appointment was announced, Kaleida confirmed it has fired 17 workers for neglecting a patient at a downtown nursing home. Those are only a few of the challenges facing Lomeo, whose predecessor was ousted less than three months ago for failing to tame the largest health care system in the region. Lomeo gave few specifics in an interview Thursday, but outlined an approach to steering Kaleida Health that emphasizes a change in culture and a collaborative approach to finding efficiencies in staffing and facilities. “What I’ve learned is we’ve got a really rock-solid organization. 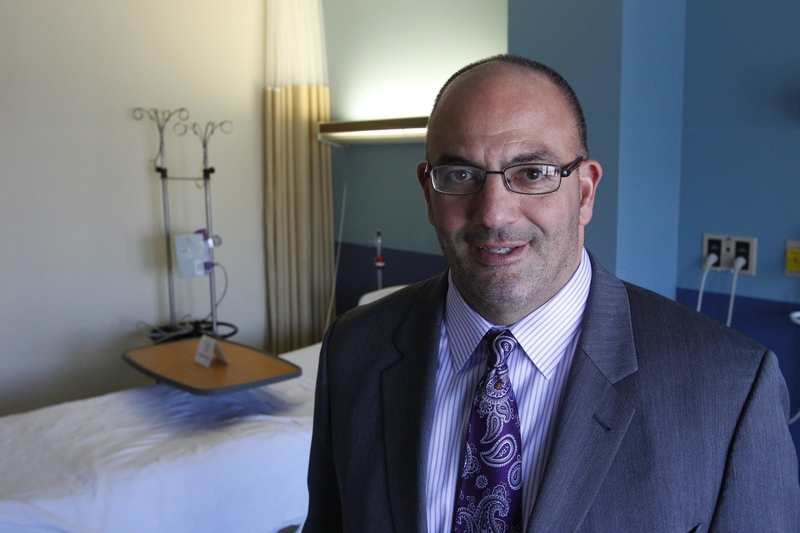 We’ve got an organization that I think is really chomping at the bit to once again lead this community to better outcomes,” said Lomeo, who served as Erie County Medical Center’s president and CEO for five years. Lomeo took charge of Kaleida Health on a permanent basis Thursday – he had served as interim president and CEO since February – at a time when health-care reform is forcing hospital systems to make financial and operational changes. Kaleida Health and ECMC, which operate under a unified governing organization, are looking to combine services, where appropriate, while confronting the fact that health care increasingly is focused on preventive care delivered in the community and not at a hospital. “Acute care centers, from my perspective, have to stop being all things to all people,” said Larry Zielinski, a former president of Buffalo General Medical Center who teaches at the University at Buffalo School of Management. To make the structural changes needed at Kaleida Health and ECMC, Lomeo needs the support of the 13,000 employees in the two systems. Officials in the health care community say Lomeo’s collaborative personality, and willingness to listen, are serving him well in that task. “He knows what he doesn’t know and knows when to seek help,” said Dr. Michael W. Cropp, president and CEO of Independent Health. Lomeo’s appointment as president and CEO of Kaleida Health, and its parent organization Great Lakes Health System, means he will give up his post as CEO at ECMC. Great Lakes Health is the umbrella body for body governing both ECMC, a public benefit corporation, and Kaleida Health, the nonprofit that operates Buffalo General, Women & Children’s Hospital, Millard Fillmore Suburban Hospital and DeGraff Memorial Hospital, as well as the Gates Vascular Institute, HighPointe on Michigan nursing home and the Visiting Nurses Association home care agency. Lomeo replaced James R. Kaskie, who was forced out in a surprise move amid apparent unhappiness with Kaleida Health’s financial performance and the slow pace of integrating with ECMC. Kaleida Health reported a loss of $14.2 million through the first nine months of 2013, according to its most recent financial statements, compared to income of $6.2 million over the same period the previous year. System officials declined to provide financial data for the full 2013 fiscal year. Kaleida Health has about 10,000 employees, and personnel costs account for about 60 percent of the system’s operating expenses. Lomeo said no decisions about job cuts have been made, but working groups are exploring whether Kaleida Health is “appropriately staffed” and are seeking ways to reduce duplication of services with ECMC. “There is tremendous talent and opportunity in the Kaleida system. There is an overwhelming willingness to deliver great, quality care to this community,” Lomeo said. Cori Gambini, a registered nurse and president of the Communications Workers of America, Local 1168, that represents nearly 4,000 Kaleida Health workers, said she has met with Lomeo five or six times since Feb. 1. She said she felt the previous administration was overly focused on the bottom line, while Lomeo emphasizes the importance of the patient. “It’s just a complete change for us,” Gambini said. Lomeo has not made any changes to top management except, in February, he replaced Dr. Margaret Paroski, a Kaleida Health executive vice president and chief medical officer since 2005, on an interim basis with Dr. George Narby. Regulatory and contractual issues make a full merger between Kaleida Health and ECMC unlikely. But the systems already have combined several of their medical specialties, including cardiac services at Gates Vascular Institute and kidney transplant and behavioral health services at ECMC. Changes in health-care financing, driven by the Affordable Care Act and other reform legislation, dictate that Lomeo must build stronger ties among Kaleida Health, ECMC, UB, physicians’ groups and other constituents in the local health care community. Lomeo said he has begun to do just that. Lomeo’s move to give up his position at ECMC is meant to help better integrate that facility with Kaleida Health. The ECMC board decided that Lomeo is “far more valuable to the community and the overall system” as president and CEO of the umbrella organization than as the head of ECMC, according to board President Kevin M. Hogan, a partner with the Phillips Lytle law firm. Richard C. Cleland, as the site president of ECMC, will assume Lomeo’s day-to-day duties there and take the interim CEO title. The other Kaleida Health facilities have their own site presidents. Michael P. Hughes, a Kaleida Health spokesman, confirmed Thursday that no national search was conducted and no other candidates were considered prior to Lomeo’s permanent appointment. “We saw first hand over the last three months what ECMC has seen for the last five years – his ability to create followership, energize his team, build trusted relationships with the full array of constituents as well as deliver results,” John Koelmel, chairman of the Kaleida Health board of directors, said. Lomeo earned $724,512 in 2013 as CEO of ECMC, according to the hospital, but is in line for a significant pay raise in his new position. Kaleida Health on Thursday did not reveal his new salary. A Buffalo native and UB graduate, Lomeo has held ECMC’s top job since January 2009, having previously taken the role on an interim basis after the resignation of Michael A. Young. He has overseen more than $200 million in investments at the ECMC campus, including the new long-term nursing facility. The former financial consultant had served on the ECMC board and directed the CEO search that led to Young’s hiring in late 2004. “We have heard from all constituencies – employees, physicians, labor, the University at Buffalo and community leaders – that the leader we need right now, is right in front of us,” Robert Gioia, chairman of the Great Lakes system’s board of directors, said. News Business Reporter Jonathan D. Epstein and News Medical Reporter Henry L. Davis contributed to this report.